F8DZY "Ham Radio only...": R71RRC Arakamchechen Island IOTA AS-071 in the mail ! 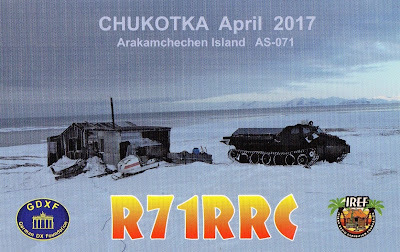 R71RRC Arakamchechen Island IOTA AS-071 in the mail ! Hi, all is in the title, just received R71RRC QSL IOTA AS-071 : so far from coconuts & sandy beaches... congratulations guys ! This is my 529th confirmed island !